Camera Austria International no. 69, 2000. The current issue of our magazine shows on its cover a different issue of Camera Austria International, which was designed by the Graz-born artist Jörg Schlick in the year 2000. 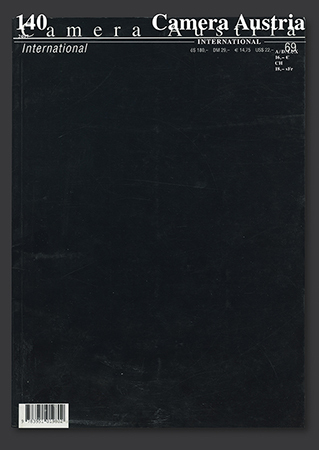 The black cover alludes to the content of this issue from the past: black pages on two different kinds of paper, with the sole text reading “ÖSTERREICH 2000″ on each right page. The editorial was inserted as a letter. It signified a radical gesture of depletion, a rejection of cultural production by way of an artistic gesture that addresses the fragile autonomy of artistic expression and the contested cultural position from which one may speak. This was paying reference to the fact that the ÖVP and FPÖ political parties came to power in the Austrian government during the same year. This coalition led, over an extended period of time, to countless protests by artists and other creatives in the cultural sector, ultimately leading to the well-known sanctions by the European Commission. At present, the two parties are once again engaging in coalition talks, yet a renewed wave of protesting has not (or has hardly) commenced. Jörg Schlick’s gesture, as expressed back then, eludes appropriation or updating. Publishing the same cover again would be equivalent to the necessity of a memory that marks the—political—distance of the present to the year 2000. Are we today facing a consolidation of reactionary political powers that are increasingly dreaming of a sealed-off, ethnically pure present that reflects the past, with its force rooted in the repression of memory of the region called Europe—constantly in flux, immersed in change, social blending, dissolution, and reinvention? How should we react to fake politics that only governs through regulatory tightening under the guise of media campaigns, Twitter, and selfies? Must we—an admittedly hegemonic term for an utterly diversified landscape of cultural producers—be constantly reminding ourselves that our agendas of recent decades have also been trying to counter precisely this development? Which instituting and institutionalizing processes have we lifted off the ground in this respect, which are presently being brought to the limits of their viability by financial responsibilities and political pressure yet again? The artists featuring in this issue—Raqs Media Collective, Miki Kratsman, and Armin Linke—themselves have been navigating for many years, with their works, these contested territories of historical oblivion, political persecution, political staging, re-colonialist hegemonies, and suppression of visibilities. Impacted by a radicalizing politics of nationalism in the United States after 9/11, Judith Butler wrote several essays that were published under the title Precarious Life. One of the main issues explored involves what can even be heard, read, seen, felt, and known. Moving outside of the official state, revisionist narrative of history and politics has meant, ever since, that the speaking subjects are threatened by an uninhabitable identity. We are of the opinion that the artists in this issue—and many others whose work we have published in recent years—deal with precisely such uninhabitable identities and attempt to construct places of (different) speech, listening, showing, understanding, and knowledge. Political pressure is rising on cultural institutions that question the status quo, the forgetting of history, in order to facilitate its re-emergence—yet as a farce? Again paraphrasing Judith Butler, the idea is to disrupt the prevailing forms of representation so that something of the fragility of life—but also of the meaning of more recent history and of the social dissolution presently pushing to the fore—can be captured. The issue is rounded off by Jan Wenzel‘s “Revolving Bookshelf”, by an extended section on recently published books, and exhibition reviews including Warsaw Gallery Weekend, various venues, Warsaw; Hildegarde Duane: Western Woman, Künstlerhaus Stuttgart; Trigger: Gender as a Tool and a Weapon, New Museum, New York; Jan Groover, GAK Gesellschaft für aktuelle Kunst Bremen; Stefan Burger, Kunsthalle Bern; The Still Point of the Turning World: Between Film and Photography, FOMU Antwerpen, Antwerp, and many others.